measures between 1.5 cm to 2.5 cm and weighs 3 to 5g. 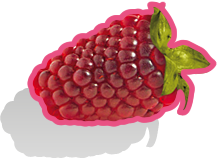 Its appearance is reminiscent to a raspberry. Green during its growth, its color becomes a dark red at maturity. The Andean blackberry is lively and refreshing. Its tangy flavor associated with its beautiful color gives it a certain refinement. Its intense and unique taste will delight all your senses. Values Values for 100 ml.